Reese Witherspoon Announces Her First Book: Whiskey in a Teacup! 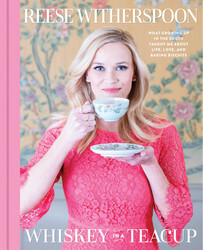 Oscar-winning actress, movie producer, entrepreneur, and now author Reese Witherspoon has shared the cover and title of her first book: WHISKEY IN A TEACUP! Packed with the secrets to southern living, this charming book will offer a sweet peek into Witherspoon’s life. She believes that “there’s a southern side to every place in the world” and hopes that this book will show you how easy it is to bring some of the south into your home. WHISKEY IN A TEACUP features style tips, recipes and menus for entertaining, ideas for special occasions, insights into her love of literature, and much more. Academy award–winning actress, producer, and entrepreneur Reese Witherspoon invites you into her world, where she infuses the southern style, parties, and traditions she loves with contemporary flair and charm.Reese Witherspoon’s grandmother Dorothea always said that a combination of beauty and strength made southern women “whiskey in a teacup.” We may be delicate and ornamental on the outside, she said, but inside we’re strong and fiery. Reese’s southern heritage informs her whole life, and she loves sharing the joys of southern living with practically everyone she meets. She takes the South wherever she goes with bluegrass, big holiday parties, and plenty of Dorothea’s fried chicken. It’s reflected in how she entertains, decorates her home, and makes holidays special for her kids—not to mention how she talks, dances, and does her hair (in these pages, you will learn Reese’s fail-proof, only slightly insane hot-roller technique). 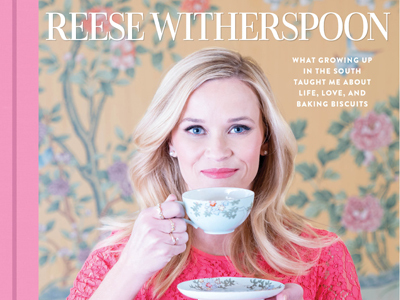 Share Reese Witherspoon Announces Her First Book: Whiskey in a Teacup!